Summary: Wal-Mart leverages Social Media. I'll explain how. Social Media or 2.0 and confusing technology babble everywhere is mostly internet pollution. Never fear it either. Bottom line, integrate technology on your blog or site in or near the decision point of purchase or conversion. Technology 2.0 is merely providing your visitors with a megaphone to share their opinion of you, what you offer or on a good day, a few angry rocks are thrown from a passionate blog or site patron and don’t we just eat that up? Raise the comfort level of a potential buyer in the purchase cycle by giving them access to peer to peer conversations. Unveil that intelligent interactive conversation as close to the decision point of purchase as possible. •	Add online B2C tactics to your B2B initiatives—and boosting response in a whole new, Web 2.0-driven way. Social media marketing, in its many forms, has taken the business world by storm. The compelling speed, cost–effectiveness, and customer engagement benefits of social media campaigns are rewriting the rules of marketing. But so much is happening so fast that it's impossible to keep track of all the options. The good news is that you don't have to boil the ocean. Effective social media campaigns require a disciplined approach to setting strategy, choosing tools and building customer affinity. Stay focused and you'll be fine. Best practices are already emerging. By understanding the new rules of new media you’ll be in the driver's seat every time you reach out to customers/prospects/stakeholders online. It's all about applying your marketing skills to the latest Web 2.0 hotspots. 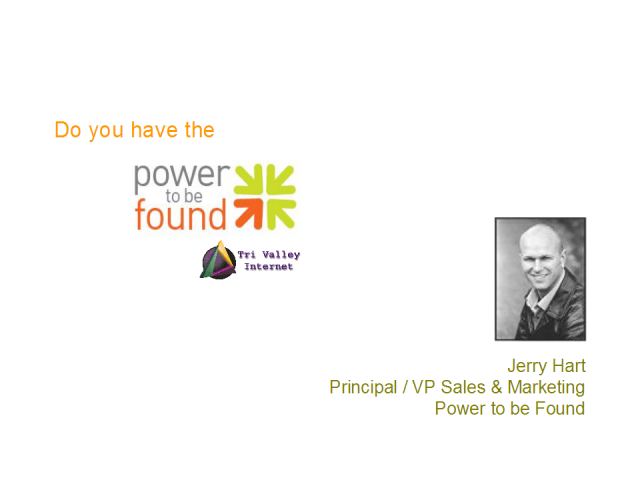 Do you have the Power to be Found? Learn what Web 2.0 really means, its associated capabilities and how to use these capabilities on your Web site to better listen and communicate with your prospects and customers.